I had a pair of these and loved them, but my stepdaughter decided to leave them in a rental car after she told me she had gotten everything out. Needless to say, when I called the rental company to see if anyone had found them, their answer was no. Imagine that.... A couple years later, I bought a new pair off the MAC Tools truck, but they were the XLs and were too big for my liking. I just so happened to look on here and voila, they had a pair at a good price and was exactly like the ones that were lost. The fit is perfect and I love them. Thanks Overstock! Half Jacket 2.0 Sunglasses Performance, protection and comfort are sculpted into a new dimension of style with an interchangeable lens design that keeps you a step ahead of changing light conditions. The latest evolution of our coveted Half Jacket® sunglass, it wraps your vision in the razor-sharp clarity of High Definition Optics® (HDO®). Wherever your sport takes you, you'll have the all-day comfort of a lightweight design that can take punishing abuse while serving up premium optical technology. Dimensions 7" x 3" x 2"
I purchased these Oakley Men's Half Jacket sunglasses for my husband. He had a pair of these years ago and just loved them. I'm glad that you had them! 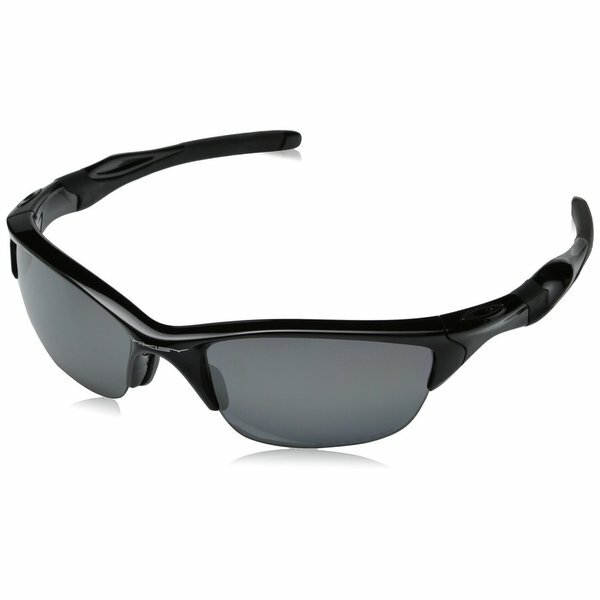 These Sunglasses are Fantastic, I got them for my husband as a gift and he hasn't' really gotten to wear them yet, but he absolutely loves them and they look wonderful on him... You can't go wrong with Oakley's.. I have to admit this is the first time I have ever bought a name brand pair of glasses, and so glad I broke free and talked myself into it.. I even got him the leash so that he can't lose them as easily.... So excited about this purchase and Overstock has the best things and quick shipping, Can't go wrong, not in my opinion anyway. I bought these for my dad. He has been wearing oakley sunglasses for my whole life. He also gets this style and when I saw them I knew they were the right ones. He had been saying he needed a new pair for months. Needless to say he was so happy when I gave them to him. They never disappoint. Great price on great sunglasses! I saw these on the brand website and than looked into them here and saved 25%! They are the same exact pair you'll find in-store. I bought these as a gift. At first they looked really small but I guess it was just the particular design of the glasses. Having said that my brother-in-law absolutely loved them and they looked fantastic on him! What can I say. These Oakley's do not disappoint. I have always owned Oakleys. These not only look sharp, but fit me just right. I have a smaller head and it is sometimes hard to find a pair that fits. These are just right. these are comfortable glasses and a great, dark colour. Wish it came with a hard case but the cloth case doubles as a cleaning cloth. Extra nose pieces came with. Excellent quality. The lenses are sort of mirror-like. Bought it as a Christmas gift. It is very well priced. The delivery was slow but well worth the wait. I really like these glasses, I just got them. I work at a dog ranch so I'll be using them daily and hope they will last. They're a little small for me, but I'm a pretty big guy. These are my first pair of Oakleys.